As the NFL offseason continues to drag on, I continue to look for ways to distract myself until it is time to draft my season long Fantasy Football teams. If you’re a big fan of drafting, MFL 10s are a great way to pass the time. You can get an early look at who Fantasy players are favoring, which helps give you an idea of who is being overvalued or undervalued. You can find my first three drafts at the bottom of the article, as well as a few other pieces discussing MFL 10 ideas and strategies. I’ve been waiting very late to draft a quarterback in most of my MFL 10s, but I didn’t particularly like any of the receivers or backs on the board in Round 6. So when Cam Newton was still hanging around, I quickly added him as one of the last picks in Round 6. I thought Newton would have trouble with his mobility in 2014 due to various injuries. His mobility did seem to be limited for most the year, but he was rushed for 50 or more yards in his last three games and scored a touchdown in his final three games as well. He has big targets in Greg Olsen, Kelvin Benjamin, and rookie Devin Funchess when he does want to throw the ball, and he is currently in a division where the defenses struggle to keep an opposing offense off the field. I have Newton ranked as the fifth-best quarterback this year. Rookie Jameis Winston finds himself in a nice situation for his first NFL season. As opposed to Derek Carr or Johnny Manziel last season, Winston has a supporting cast of veteran and up-and-coming talent to help his growth. From veteran Vincent Jackson, to younger talent like Mike Evans and Austin Seferian-Jenkins, Winston has the targets to be successful. Of course, it will all boil down to how well he can utilize his weapons, but he wasn’t placed in a situation where he was destined to fail. I wouldn’t want to rely on him as my starter, but I don’t have any issues with him being my backup in a format like this. I took more gambles at the wide receiver position and running back position in this draft than I normally do. I have the rushing attack centered around Adrian Peterson. I didn’t select my next running back until Round 5, who was Giovani Bernard. While Bernard won’t be the featured back in Cincinnati, he will still be a key player in the offense. Bernard may have only rushed for eight yards in Week 17, but he hauled in seven receptions for 56 yards and a touchdown (18 points in full PPR leagues). I followed Bernard by selected Doug Martin in Round 7 and Devonta Freeman in Round 8. Martin has burned the hopes and dreams of Fantasy players every year after his rookie season, but 2015 should be different. The new offensive coordinator Dirk Koetter fought to keep Martin around, and Martin has lost weight in order to regain speed and increase his elusiveness. It’s risky if you had to rely on Freeman in standard scoring leagues, but I get the benefit of Freeman only starting when he has a good game. He’s in a committee approach with rookie Tevin Coleman, but again, I don’t have to worry about when to start or when to sit Freeman. This was the first time I became an owner of Darren McFadden this season, but I thought he was a good deal as a ninth-round pick. It’s still murky in the backfield for Dallas, but I didn’t spend a lot to find out what McFadden can do next season. Reggie Bush also offers nice value in Round 11. He offers a different skill set than Carlos Hyde, and I think Colin Kaepernick is going to love having a true pass-catching back. My last pick of the draft was Bilal Powell. The New York Jets’ depth chart is busting open with running backs, but Powell is valuable in a PPR format because of his pass-catching abilities. I wanted to start off with two solid receivers, and then I decided to focus on value picks later in the draft. I selected Randall Cobb in Round 2 and T.Y. Hilton in Round 3, but I didn’t draft another wide receiver until Round 10. I then built the rest of my receiving core around players who could have a big week. All of the attention was on Odell Beckham Jr. last season, but Rueben Randle quietly finished with a solid receiving yards (938). 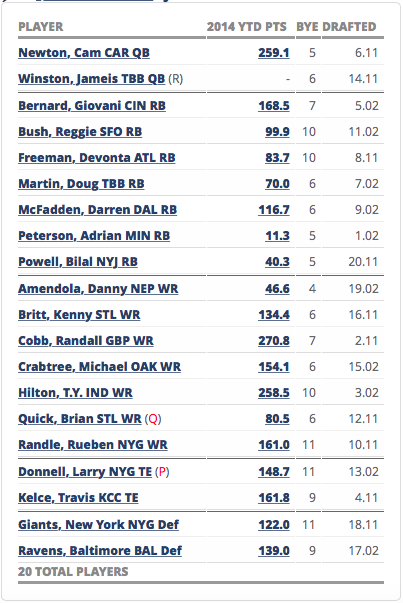 I haven’t drafted Brian Quick in any other MFL 10s, but this seemed like the draft where I wanted to shake things up. Quick started the 2014 season strong but faded away and then became injured. In case he didn’t work out or isn’t ready for Week 1, I backed him up with Kenny Britt. Britt now at least has a consistent quarterback with Nick Foles running the show, and he is one of the best targets Foles will have to work with. I threw Michael Crabtree into the mix because it seems like more and more people are avoiding him, which makes me want to draft him. All signs point to Amari Cooper being ready to take over the NFL in Week 1, but Crabtree trumps Cooper in experience. As a pick in Round 15, it won’t hurt me if Crabtree is a complete bust. Finally, I added Danny Amendola to my roster in the last round just incase he has any upside in New England. Although he had limited involvement last season, Amendola and Jimmy Garoppolo connected together a few times last season. You can check out who the second-year quarterback targeted when he was on the field in my article through the So-Called Fantasy Experts. I hate to follow the hype of a crowd, but I think it makes too much sense to draft Travis Kelce. The 6-foot-6 tight end omitted that he was not healthy entering the 2014, so there is optimism that he could improve on a nice campaign of 862 receiving yards and five touchdowns. Jeremy Maclin‘s involvement doesn’t encourage or discourage me. Alex Smith loves his running backs and tight ends, and Kelce is going to get the ball regardless of the presence of anyone else. I backed the big tight end up with another big tight end, Larry Donnell. The third-year tight end started the year hot but lost steam as the season wore on. Blocking issues reportedly kept him off the field, but Donnell spent time training on his hand placements and blocking during the offseason. Another big target at 6-foot-6, Donnell could see increased work in the red zone if he can stay on the field. Defenses of course are hit or miss, so I like the fact that MFL 10 players hold off on drafting a defense. I selected the Baltimore Ravens as my first defense in Round 17, and I followed that up by selecting the New York Giants in Round 18. I like the fact that the Ravens will face Josh McCown or Johnny Manziel twice a year, and I also like the fact that the New York Giants will face the Washington Redskins twice.